Turkish frigate TCG Gediz is nearing the end of her long deployment to the Asia. In 26 day time she will arrive in Turkey. Her deployment is for the commemoration of the 125th anniversary of the Ottoman frigate Ertugrul’s historic voyage from Istanbul to Yokohama. She has finished her port visit in India today and is heading to Male, the capital of the Republic of Maldives. Commander of the Turkish Navy frigate TCG Gediz, Yusuf Kocaman, may have steered his ship out of Chennai on Saturday morning towards the Maldivian capital Male but the pleasant memories of the city would remain evergreen in his memory making him to return at the earliest possible opportunity. “Next time when I visit Chennai, I will drop anchor for a minimum of three days. 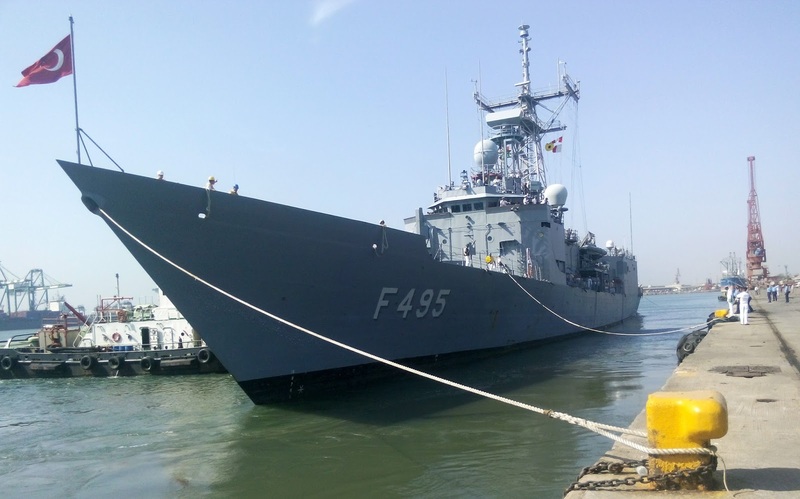 Two days are not enough,” said Kocaman on board the TCG Gediz, which was acquired from the United States in 2000 and was known as USS John A Moore, the 11th ship of the Oliver Hazard Perry class of guided-missile frigates. Talking about Gediz’s Chennai visit, he said Turkey is observing the 125th anniversary to retrace the Ottoman frigate Ertugrul’s historic voyage from Istanbul to Yokohama. Interestingly, Kocaman was expecting joint naval exercises with Indian Navy. “We wanted to have joint Navy exercises with INS Sumitra, the fourth and last Saryu class patrol vessel of the Indian Navy. Unfortunately it never happened. We only had two days of reception. Next time, we will plan to have at least three days of stay in Chennai port.” He also recalled his interaction with INS Sumitra crew in Djibouti. “Chennai is the 15th port. We will be going to Male next and return to the Aksaz naval base in Turkey on July 31,” Kocaman said. “By then, we would have sailed 20,300 nautical miles which is equal to the perimeter of the world. We would also have visited 18 ports in 13 countries,” he added. The commander of Turkish Naval Forces Admiral Murat Bilgel, is in India for an official visit. According to news from India he will return on 12th November. Murat E Bilgel, the Commander of the Turkish Naval Forces (CTNF) visited Western Naval Command of the Indian navy at Mumbai from 06 to 08 Nov 12. During his visit, CTNF interacted with Vice Admiral Sekhar Sinha, the Flag Officer Commanding-in-Chief and other Senior Officers of the Western Naval Command. Vice Admiral Sekhar Sinha with Commander of the Turkish Naval Forces Admiral Murat E BilgelMDL. He was impressed with India’s warship building capability at MDL and repair facilities at Naval Dockyard, said the MoD release. India and Turkey have a history of friendly and cordial relations. Turkish Navy and Indian Navy relations have witnessed an upward rise during the recent past, which has been marked by visits of senior officers of both Navies to each other’s country. In addition, Turkish and Indian Naval ships have visited each other’s parts regularly.